The Phillips curve suggests there is an inverse relationship between inflation and unemployment. This suggests policymakers have a choice between prioritising inflation or unemployment. During the 1950s and 1960s, Phillips curve analysis suggested there was a trade-off, and policymakers could use demand management (fiscal and monetary policy) to try and influence the rate of economic growth and inflation. 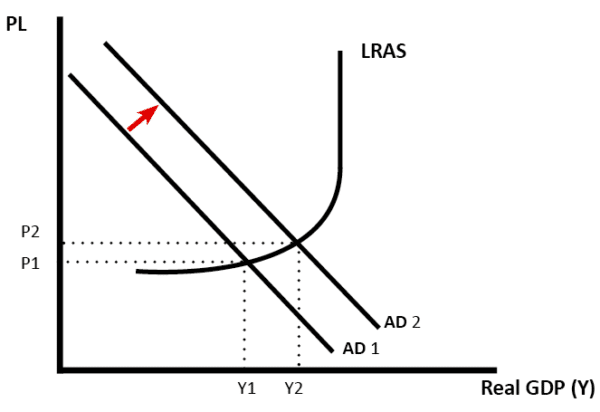 For example, if unemployment was high and inflation low, policymakers could stimulate aggregate demand. This would help to reduce unemployment, but cause a higher rate of inflation. 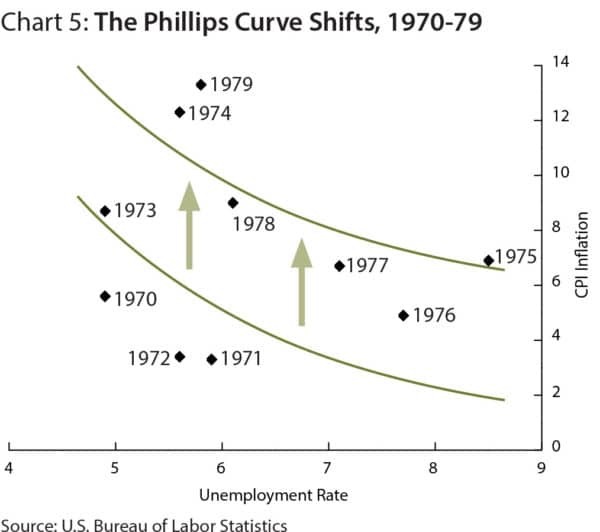 In the 1970s, there seemed to be a breakdown in the Phillips curve as we experienced stagflation (higher unemployment and higher inflation). 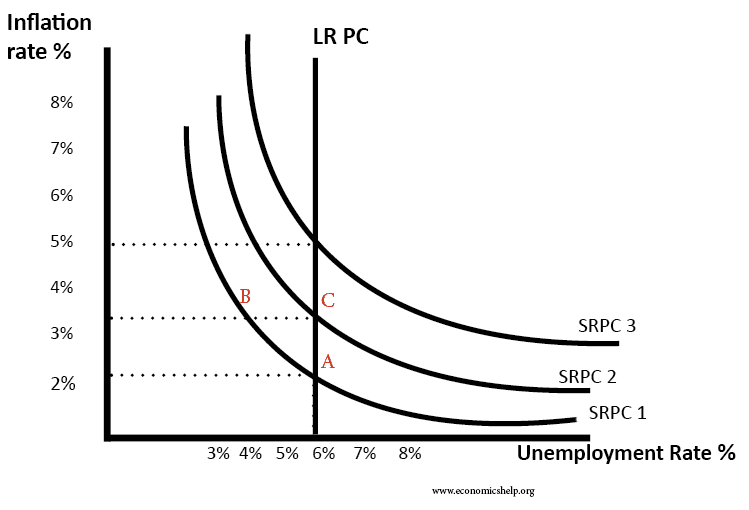 The Phillips Curve was criticised by monetarist economists who argued there was no trade-off between unemployment and inflation in the long run. However, some feel that the Phillips Curve has still some relevance and policymakers still need to consider the potential trade-off between unemployment and inflation. 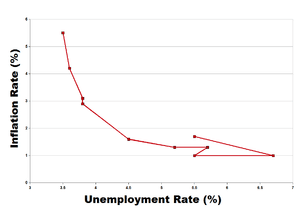 The Phillips curve originated out of analysis comparing money wage growth with unemployment. The findings of A.W. Phillips in The Relationship between Unemployment and the Rate of Change of Money Wages in the United Kingdom 1861–1957 suggested there was an inverse correlation between the rate of change in money wages and unemployment. For example, a rise in unemployment was associated with declining wage growth and vice versa. 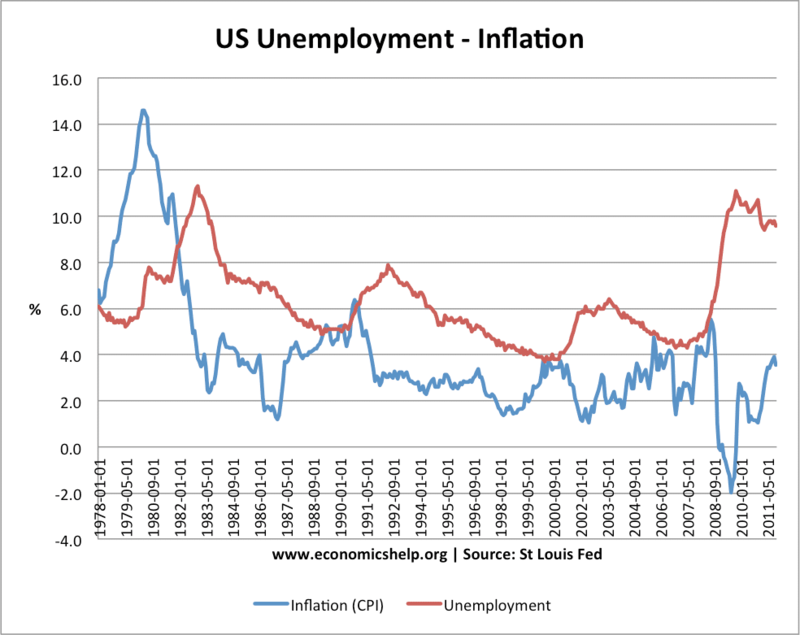 This analysis was later extended to look at the relationship between inflation and unemployment. Again the 1950s and 1960s showed there was evidence of this inverse trade-off between unemployment and inflation. 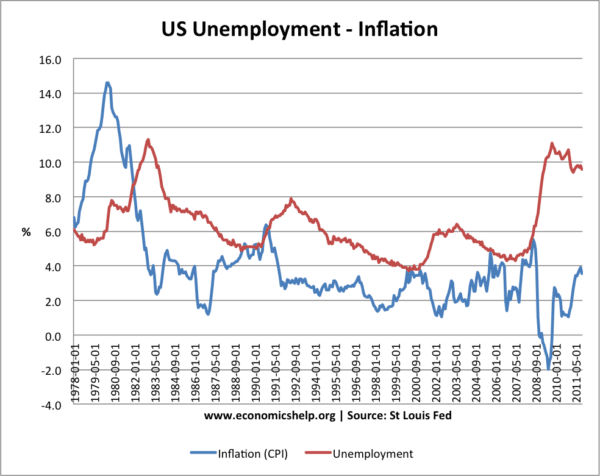 There are occasions when you can see a trade-off between unemployment and inflation. For example, between 1979 and 1983, inflation (CPI) fell from 15% to 2.5%. During this period, we see a rise in unemployment from 5% to 11%. In 2008, the recession caused a sharp rise in unemployment and inflation became negative. 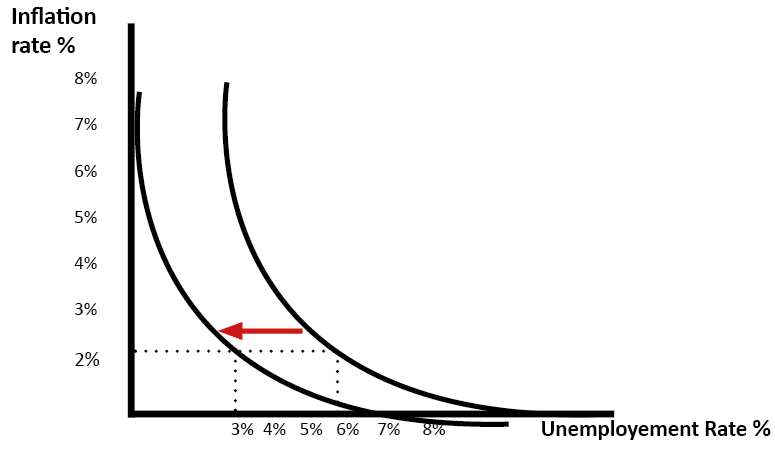 Why is there a trade-off between unemployment and inflation? An increase in aggregate demand (AD to AD2) causes higher real GDP (Y1 to Y2). Therefore firms employ more workers and unemployment falls. However, as the economy gets closer to full capacity, we see an increase in inflationary pressures. 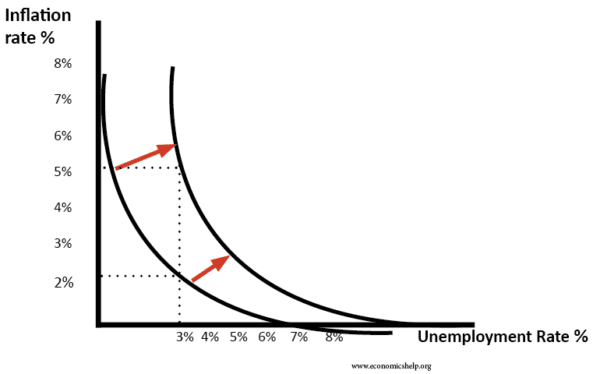 With lower unemployment, workers can demand higher money wages, which causes wage inflation. Also, firms can put up prices due to rising demand. Therefore, in this situation, we see falling unemployment, but higher inflation. 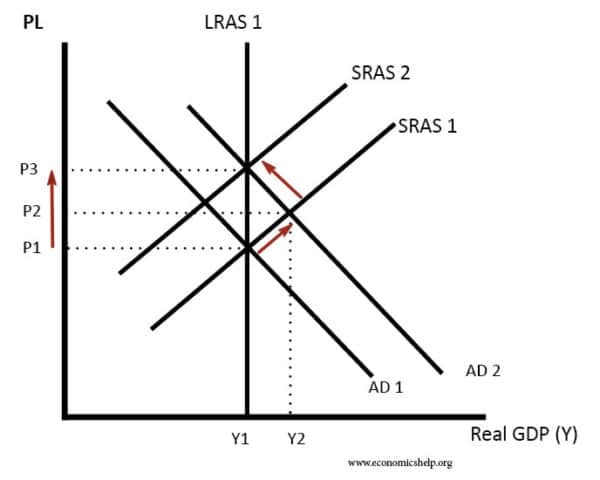 The increase in AD only causes a temporary increase in real output to Y1. After inflation expectations increase, SRAS shifts to left (SRAS2), and we end up with higher inflation (P3) and output of Y1. This AD/AS model explains why we only get a temporary fall in unemployment. Adaptive expectation monetarists argue there is only a short-term trade-off between unemployment and inflation. Rational expectation monetarists argue there is no trade-off, even in the short term. The rational expectation model suggests that workers see an increase in AD as inflationary and so predict real wages will stay the same. Evidence from the 1970s suggested the trade-off between unemployment and inflation had broken down. The 1970s witnessed a rise in stagflation – rising unemployment and inflation. Monetarists argued that increasing the money supply just led to a wage inflation spiral and did not help to reduce unemployment. They advocated reducing the money supply and achieving low inflation – any unemployment would just prove temporary. However, others argued there was still a trade-off – the Phillips curve had just shifted to the right giving a worse trade-off because of cost-push inflation. In late 2008 we saw a rise in the unemployment rate and a fall in inflation. This was due to the recession and falling oil prices. If the economy is operating below full capacity, a significant increase in aggregate demand is likely to cause a reduction in unemployment and higher inflation. Most economists would agree that in the short term, there can be a trade-off between unemployment and inflation. However, there is a disagreement whether this policy is valid for the long-term. Monetarists would tend to argue the trade-off will prove short-term, and we will just get inflation. Monetarists place greater stress on the supply side of the economy. However, Keynesians argue that demand deficient unemployment could persist in the long-term. If there is a significant negative output gap, boosting AD could lead to lower unemployment and a modest increase in inflation. In a deep recession, this fall in unemployment will not just be temporary because there will be no crowding out. In an ideal wopolicymakersakers will aim for low inflation and low unemployment. To achieve this, we need economic growth that is sustainable (close to long-run trend rate) and supply-side policies to reduce cost-push inflation and structural unemployment. If these criteria are met then it becomes easier to achieve this goal of lower inflation and lower unemployment. In the current economic climate, many Central Banks and policymakers are weighing up how much importance they should give to reducing unemployment and inflation. For example, the Federal Reserve is considering using monetary policy to achieve an unemployment target and a willingness to accept higher inflation. During 2009-13, the Bank of England has been willing to tolerate inflation above the government’s target of 2% because they feel to reduce inflation would have caused serious problems for unemployment and economic growth. This willingness to consider a higher inflation rate, suggest policy makers feel that the trade off of higher inflation is worth the benefit of lower unemployment. However, not all economists agree we should be allowing the inflation target to increase. If we allow inflation to increase, inflationary pressures will become engrained, and monetary policy will lose credibility. The ECB would be unwilling to tolerate higher inflation – even as a measure to reduce unemployment in Europe. Hi,i am student of university of abuja nigeria.pls explain the relationship between unemployment and inflation with the aid of philip curve. 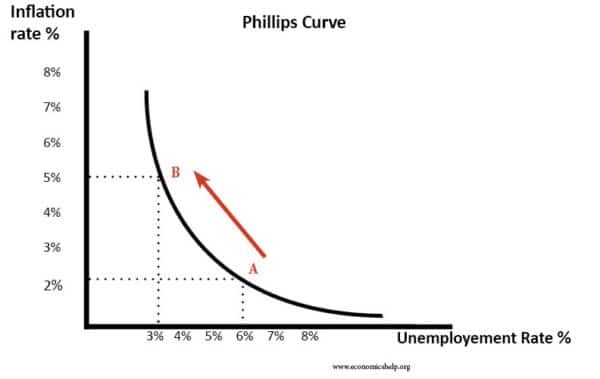 hi iam a student at polytechnic of Namibia.can you please explain the relationship between inflation and unemployment with the aid of phillips curve? 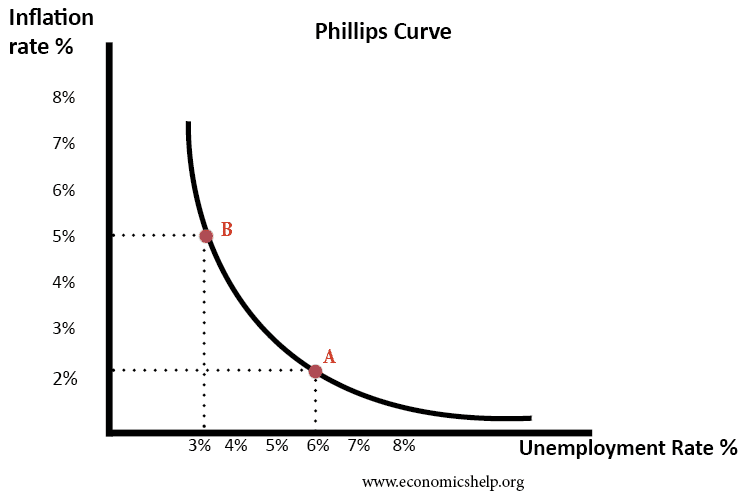 can you please explain the relationship between inflation and unemployment with phillips curve? I,m student of Islamia university from Pakistan. please guide me about policy implication of philips curve in macroeconomics..